ALBINO MORAN SHIPBROKERS SL is serving as technical advisor to PLATINUM EQUITY on the acquisition of IBERCONSA GROUP. Freezing Longliners "ARNELA" & "MAR DE MARIA"
TUNA LONG LINER LL-13060; Prompt delivery! Modern FREEZING LONGLINER LL-7904 Blt 2003 , Loa 50 m , is presently available for inspection at Spanish port. Season's Greetings and a Prosperous and a Happy New Year! For sale rebuilt MOONZUND type trawler FST-9904, built in 1989, flag – Russia. Participation in European Seafood Exhibition in Brussels 23-25 of April 2013. 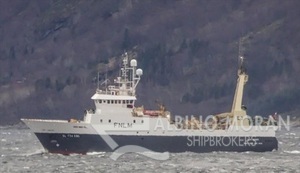 Modern Freezing Stern Trawler Built in 1998, LOA x B - 58x13.5, M/E 4000 BHP is available for inspection on 2nd week of February 2013. 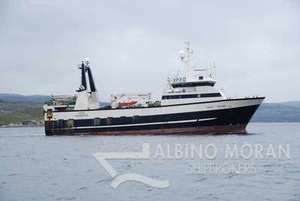 Tuna purse seiner XIXILI, with 80 m length, has been sold to international interests by Albino Moran & Partners Shipbrokers, S.L. 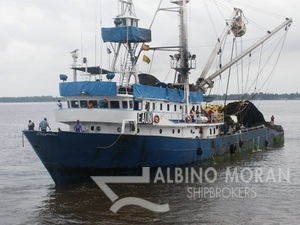 Freezing longliner URGORA has been sold from Panama to international interests by Albino Moran & partners Shipbrokers, S.L. ALBINO MORAN & PARTNERS has participated, as broker, in the partnership of AMASUA and CNFC into KRUSTAMOZ, a shrimp fishing company in Mozambique. We have just concluded the chartering of the iranian reefer vessel KOOSHA 4 for the trading in the Indian ocean. 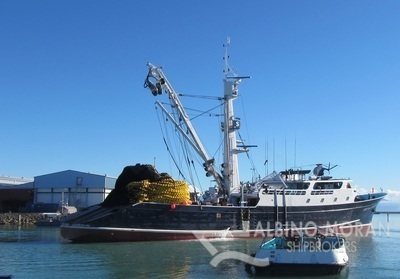 Freezer trawler M/V AMOR SACO (Ex GAROYA SEGUNDO) sold from Spain to international interests.